Q&A Layout is a complete question and answers discussion board for professional support and for communities similar to Stack Overflow. Perfect platform for users to ask and answer questions, and, through membership and active participation, to vote up or down. 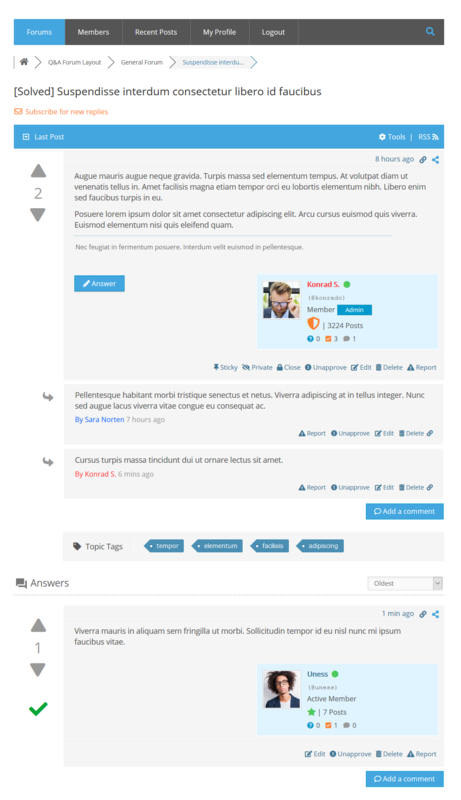 The screenshot above displays Q&A forum layout with two modes. 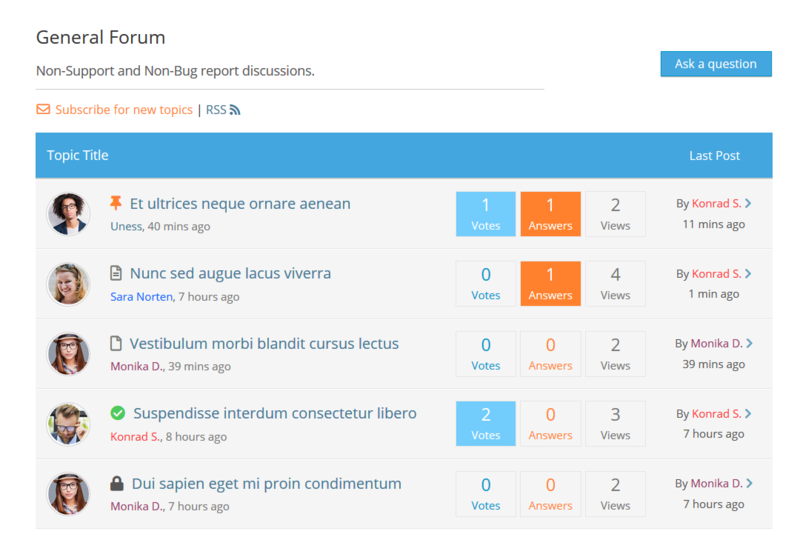 On first (left) mode, besides Forum title and Description you can see a list of latest Questions statistic data, such as number of Votes, Answers, Views, Replies (answers+comments) as well as Question Title, Author name and Date information under each forum panel. On second mode (right) the latest Questions are collapsed. This can be managed in settings page or can be opened/collapsed using the blue, small arrow next to orange “Recent Questions” phrase. There are two specific options in Forums > Settings > Forums admin page. 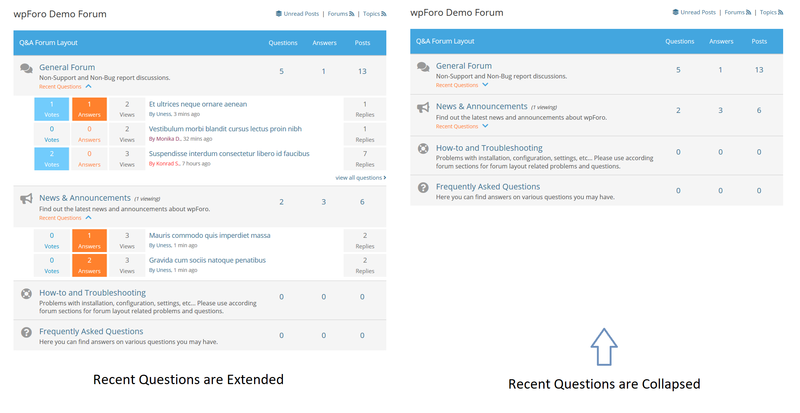 You can set Recent Questions (topics) opened/collapsed by default and set number of recent topics displayed under each forum panel. The screenshot above displays Q&A questions layout. Each topic displayed with statistic data, such as number of Votes, Answers, Views, Replies (answers+comments), last post author name, date as well as Question Title, Question author name and Date information. Q&A Layout post list is bit different. Here you can see three type of posts. The first red marked post is the Question, this post has two blue buttons [Answer] [Add a Comment]. If other user has an answer, he/she click on this button and leave an Answer. It looks like the second red marked post. The [Add a Comment] button users use to ask for more information or suggest improvements, these posts are not answers. 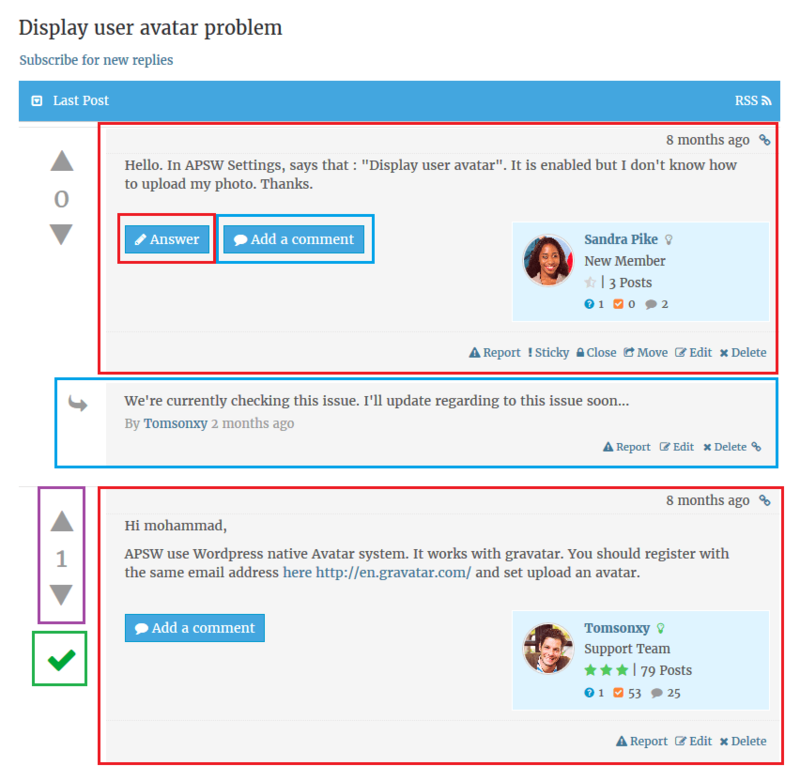 Comments are marked with blue color in the screenshot. They becomes a small panel under Question and Answers. On the left side of Questions and Answers panels you can see Up/Down vote arrows (purple). This allows forum users to vote and help other users to find the best answer in Answer list. In addition, there is a green marked icon under voting arrows. If this icon is active (green), it means this answer has been selected as helpful (correct) by Question Author.